James Buckner on the Bible. Refuted. Winner! This article has won James Buckner's prestigious "unworthy answers (which I have no answers for)" award. Thanks, J. B.! Here's another answer key for a popular list of "Bible problems" online. It's all stuff we have seen before, but let's start with a few comments. To those of us who are favorably disposed to capitalism, I now take the persona of a Marxist critic, who asks you these questions: "Why does capitalism exploit the poor? Why is poverty so prevalent in capitalist countries? Why are there so few social liberties in capitalist society?" Where's your answer? You don't have one for me now? Why not? Actually we all know that you don't have a problem, not because of my questions, at any rate. Questions like these are not so much questions as they are summary protests of what the protestor thinks is a regular and recurring problem. It's assumed that he has the stats to back up the claim that capitalism exploits the poor; yet what he has, if it all, is some anecdotal evidence that some poor have been exploited by some capitalists somewhere at some time, and this has been taken as an overstated generalization representing a fixed condition associated with the capitalist method. You won't be able to answer the question, not without pages of documentation and explanation, and the questioner knows this. I call this tactic "hurling the elephant." Many of Buckner's questions are of this order. They are "sound bites" intended to win a rhetorical victory among people already persuaded of a similar point of view. As such really do not deserve to be taken seriously. It is just as easy to say in reply, "Capitalism doesn't exploit the poor" -- and in a few cases, this is all my response will amount to, because I think it is Buckner's burden to prove out a systematic pattern genetically linked to Christian belief, with reference to the issue under consideration -- not just ask "Why?" and think he is done with it. Second: Many of Buckner's questions reflect not actual problems within Christianity, but unmet expectations within his own personal experience. In many cases he clearly came to Christianity with a perception, "Christianity means X", and came away disappointed when X remained unfulfilled. To put matters bluntly, that's a deficit in his own understanding, not a fault of Christianity. Third: By far Buckner's questions mostly involve a presupposition that he's done all the necessary study to make an authoritative decision. As can be easily seen on issues of fact, that is obviously not the case. Buckner thinks he has done adequate study; actually, far from it. What I find most difficult to believe is that after 23 alleged years of study -- thiswas the best he could do. Through years of participation in the life and culture of evangelical Christianity, a number of "difficult to understand" issues came to my attention. The approach to these problems endorsed by evangelical Christian leaders is for thoughtful Christians to accept the "difficulties" as inscrutable but nevertheless true, and to endeavor to strengthen one's faith in other areas where "difficulties" are not a hindrance. This approach, as I'll call it, may indeed be taught in some places, but it isn't taught in the church I now attend, nor elsewhere I have been. There was apathy in my previous church, but the one I am in now encourages education and consideration of these issues. There are indeed many churches with the problem Buckner describes, but there's certainly no reason why he could not have done his own work. I acquiesced to this approach while I lived my busy life, until such time as I should be able to search out the solid answers that evangelical theologians had undoubtedly derived from their more thorough and sophisticated study of scripture. After years of studying the Bible as an individual and in groups, listening to sermons, attending Christian conferences, leading a small group Bible study, reading evangelicalism's best apologists, and even preaching from the pulpit once, I was dismayed to discover that the church cannot answer the tough questions about Christianity. I have led a busy life, did my study, and somehow, I came up with answers, whereas Buckner didn't. Again we are led to ask why. Anticipating that many Christians will not accept my conclusion, and that they will urge me to come back to church and continue "searching," because of Jesus' promise that those who seek will find (Matthew 7:7; Luke 11:9), I have listed some questions the church must answer if it hopes to regain my attention. I don't look for Buckner to care to look again one way or another, but for those interested, below are answers to and comments upon all the questions within my purview. 1. Why does the evangelical church say there are no contradictions in the Bible when they are plainly there for anyone to see? (These are too numerous even to list a representative sample here. There are many books and monographs on this topic in the skeptical literature. Buckner refers his reader in a footnote to the works of non-scholars like Dennis McKinsey whose works are refuted on this site. There are many, many more books and monographs addressing and solving these issues, both directly and indirectly through study. So my question in reply: "Why do skeptics keep quoting non-experts like Thomas Paine, while scholars familiar with the languages, culture, and context of the Bible, like Ben Witherington and Bruce Malina, are ignored?" 2. Why does the Old Testament teach that there is no hell, while the New Testament teaches that there is? The idea of "progressive revelation" does not explain the conflicts in the biblical texts. The OT does not teach that there is "no hell" -- one may perhaps say that the OT does not mention hell, but since it does teach punishment for the wicked in the coming kingdom of God, and teaches Sheol, it hardly matters if it doesn't assign a location or use the name "hell". Beyond that, what's the difficulty with "progressive revelation"? It hardly seems unlikely that there were teachings that men were unready for at a certain period. Certain Skeptics have asked why it is that a loving God didn't send the plans for a steam engine down to primitive tribes; the answer lies in the question, "Do you think it would have been good to do so?" It is interesting that the humanist program Star Trek makes a virtue out of the doctrine of non-interference (the "Prime Directive" for us Trekkies), so that an advanced civilization would be morally bound to not interfere with a developing society, even a primitive society beholden to disease and war, whereas when God uses His own "Prime Directive" and gives us only what we can handle or what we ask for, it is somehow considered a problem. That said, I think "hell" properly understand can already be inferred from the OT readily. It would be assumed from the honor-shame dialectic of the ancient world that those who were bad in this life received shame from God -- in this life and on into their next one. 3. Why does most of the Old Testament teach that there is no afterlife (see Ecclesiastes 9:5-6, for example), while later Old Testament writings and the New Testament do? The purpose of Ecclesiastes shows that 9:5-6 does not "teach that there is no afterlife" -- Ecclesiastes is an ancient dialogue, not a doctrinal treatise. 4. Why does the church say that God is not the author of confusion (1 Corinthians 14:33), when many biblical passages flatly contradict this? This is one of those "Why does capitalism exploit the poor?" questions. Since it is not specific in validating the alleged "confusion," my answer: Buckner is the author of his own confusion. My question also: Why does he have problems while I and other do not? 5. Was God known by the name Yahweh prior to Moses (Exodus 6:3), or was he not (Genesis 4:26, 5:29, 9:24, 22:14, 27:20, 27:27, 28:20-21)? See When was the name "Yahweh" known? 6. Which "Ten Commandments" are the Ten Commandments - the ones listed at Exodus 20 and Deuteronomy 5, or the ones listed at Exodus 34? Only the list at Exodus 34 is explicitly called the "Ten Commandments" in the biblical text. 7. Was the Law given by Yahweh perfect (Psalm 19:7), or wasn't it (Hebrews 8:6-8)? Buckner does not grasp covenantal issues here. The law is perfect indeed, but the contextual issue for David is that the law is without blemish in and of itself. The contextual issue for Hebrews is that we now have a "better covenant, which was established upon better promises." The Greek behind better is kreitton, meaning stronger, nobler, or better (Heb. 1:4 Being made so much better than the angels, as he hath by inheritance obtained a more excellent name than they.). Psalms refers to the law. Hebrews refers to the covenant. There is a difference between the law and an agreement to follow the law. One is the terms of the covenant; the other is the covenant itself. Buckner's question ignores the difference. 8. Why can't the six accounts of the resurrection be reconciled? Paul says that without the resurrection, the Christian faith is in vain (1 Corinthians 15:14). How could the biblical accounts possibly disagree on such an important narrative? See here and here and here. Let us note also the conclusion of secular historian Michael Grant, that whatever the differences, the evidence is sufficient to warrant the conclusion that the tomb was found empty; if so, then the divergences also have no impact on the resurrection. 9. Why were the disciples surprised by Jesus's resurrection after Jesus had told them repeatedly to expect it? An angel even reminded the women that Jesus had told them of his impending resurrection (Luke 24:6-7). How is it that the women remembered his words (Luke 24:8), but the disciples didn't (John 20:9, Luke 24:12)? Even Jesus's enemies remembered that he had foretold that he would rise again (Matthew 27:63). Biblical Ambiguities and Omissions -- in many cases here, it is clear that "ambiguous" simply means Buckner didn't understand something and thinks his perception is universal. 1. Why is the Bible unclear about how to be saved? Is there anything more important that the Bible could communicate? Why is it ambiguous and contradictory on this subject? How is it ambiguous or contradictory? Since it is not explained, no answer is warranted. 2. Why does Jesus teach salvation by works in the synoptic gospels, but John portrays him teaching salvation by faith? Surprise answer: Yes, salvation by works is taught in the Bible; but it is also taught that no one can go this way. See here. 3. Why does John not teach in his gospel that it is necessary to repent of our sins, since he states that his gospel was written specifically for the purpose of showing people how to be saved (John 20:31)? Indeed? John 8:21, "Then said Jesus again unto them, I go my way, and ye shall seek me, and shall die in your sins: whither I go, ye cannot come." That's Element 1: The wages of sin is death. You need to get rid of them if you don't want to die. How do you shed sin? Repent. This is taught throughout the OT and was known in first-century Judaism as well. And how does one repent? John 12:36, "While ye have light, believe in the light, that ye may be the children of light." John 3:16-21, "For God so loved the world, that he gave his only begotten Son, that whosoever believeth in him should not perish, but have everlasting life. For God sent not his Son into the world to condemn the world; but that the world through him might be saved. He that believeth on him is not condemned: but he that believeth not is condemned already, because he hath not believed in the name of the only begotten Son of God. And this is the condemnation, that light is come into the world, and men loved darkness rather than light, because their deeds were evil. For every one that doeth evil hateth the light, neither cometh to the light, lest his deeds should be reproved. But he that doeth truth cometh to the light, that his deeds may be made manifest, that they are wrought in God." It's there for anyone who reads it. 4. Why is the nature and practice of the two sacraments - baptism and the Lord's Supper - left ambiguous in the Bible, and a cause of discord among churches? It's hard to answer without specifics, but in terms of the idea that baptism is required for salvation, see here -- the confusion is all our own and comes of reading our own agenda into the text. As for "discord", I see plenty of healthy discussion, but I don't see congregations burning down each others' houses of worship over this, or anything like that. 5. Why is the book of Revelation incomprehensible if it is really "not sealed" (Revelation 22:10)? Why are the prophecies in the book of Daniel actually easier to understand, if they are sealed (Daniel 12:9)? Revelation is incomprehensible only to those who don't consult the scholarship. 6. Why doesn't the Bible provide unambiguous answers for major divisive doctrines like efficacy of baptism, pædobaptism, mode of adult baptism, soteriology, Christology, trinitarianism, satanology, angelology, nature of the afterlife, eschatology, fundamentals of the faith, the standing of Jewish believers in relation to the Law, the standing of Gentile believers in relation to the Law? 2. Why did the gospel writers use the Septuagint, an inferior translation of the Old Testament? Did the Holy Spirit fail to inspire them with the more accurate Hebrew text, the one accepted today? See here. It was not "inferior." 4. Why did Mark misreference an Old Testament prophet (Mark 1:2)? How can we rely on Mark to explain Old Testament prophecies to us if he is even mistaken about the source? 5. Why does Jude quote the non-canonical Book of Enoch as prophecy (Jude 14-15)? Did the Holy Spirit fail to inspire Jude with the fact that the Book of Enoch would not be accepted into the canon? That Enoch didn't make it into the canon is of no relevance. Quoting outside the canon is not forbidden -- all that matters is that the point quoted is true. Why is quoting outside the canon a problem anyway? 6. Why does Matthew quote a non-existent Old Testament prophecy (Matthew 2:23)? Was he using non-canonical writings, too? 7. Why does Matthew attribute a quote about the potter's field to Jeremiah, when Jeremiah has no such passage, and the closest one in the Old Testament is Zechariah (Matthew 27:9-10; Zechariah 11:12)? See comment under Matthew 27:9-10 here. 8. Why doesn't Paul ever quote Jesus from the gospel accounts, or show that he knew anything at all about Jesus's teachings and life as portrayed in the gospels? See response to Earl Doherty. 9. Why is no single hermeneutic adequate for interpretation of scripture? Why were the New Testament authors so free and loose in their hermeneutics? How could it be that the meanings of some words and phrases have been lost? How could it be that some cultural references have been lost? How can it be that many books and passages admit of multiple interpretations? Doesn't God want us to understand his Word enough to protect the knowledge of its referents and use unambiguous diction and phraseology? The basic answer is human ignorance and agenda-setting. Why is God responsible for this? Buckner refutes his own questions. On NT use of the OT see above link. Again, this is Buckner using his own expectations as a grid and then wondering why his expectations were not met. One may as well ask how it is it took the Rosetta Stone to again understand hieroglyphics. There is no such thing as diction and phraseology that remains stagnant and unchanging -- and if it does change, that's our decision, not God's fault. That said, the Bible is not so changed that the message of salvation isn't clear to those who come without a preconceived agenda and willing to get do some homework. 1. Why doesn't prayer work, when the Bible promises that it will (John 14:14, for example)? 2. Why aren't Christians doing greater works than Jesus did, since he himself said they would (John 14:12)? The context is clearly referring to miracles. No it isn't -- see here. 1. Why have no prophecies been demonstrated to have been fulfilled? Why are many Old Testament prophecies too vague to be tested? Why are many Old Testament prophecies "yet to be" fulfilled? Why has it been impossible to demonstrate that the Old Testament prophecies were written prior to the events forecasted? General questions, general answers: Plenty have been shown to be fulfilled. Vagueness is in the eye of the uneducated beholder. Why (or how) is it impossible to demonstrate with certainty that the works of Tacitus were written when they supposedly were? If Buckner answers these, I'll answer him. 2. Why wasn't Tyre destroyed by Nebuchadnezzar as prophesied by Ezekiel (Ezekiel 26)? When it was destroyed by Alexander the Great, why didn't it remain desolate as prophesied by Ezekiel? 3. How can it be that Isaiah prophesied a temporary destruction of Tyre, while Ezekiel prophesied a permanent destruction (Ezekiel 26:14,21; 27:36; 28:19 versus Isaiah 23:13-18)? Isaiah's words do not prophesy anything for Tyre beyond seventy years. There is no "temporary destruction" being predicted. 4. Why wasn't there a 40-year period in Egypt's history when the whole land was devoid of people and animals, as prophesied by Ezekiel (Ezekiel 29:11-12)? See here -- though I have found some hints that this was fulfilled if different chronologies are used. 5. Why is so much of New Testament prophecy incomprehensible? Why produce a prophecy at all if it cannot be understood? Once again, incomprehensibility is in the eye of the beholder who does not do research. But how about specifics? Maybe he means the Olivet Discourse? 1. Why haven't any of the miracles recorded in the Bible been independently confirmed? What or who does Buckner want confirmation from, and why should there be any, and how specific does he expect it to be, and why? Buckner's type of argument refuted here. There are pagan and Jewish critics and writers who admit Jesus was a miracle-worker, though they name no specific miracles. 2. Why don't verifiable miracles happen today? What better way is there to convince people of the Christian message, and isn't that the commission given to the church by Jesus? Miracles actually didn't happen much before, either -- there are probably less than 50 recorded in the NT over a period of 50 years, and miracles tend to be clustered around times of crisis. As far as convincing people, no, it isn't the best way, and while it is easy to say it is in hindsight and with assumption, most people will end up looking at miracles through their own interpretive grid. Matt. 12:24, "But when the Pharisees heard it, they said, This fellow doth not cast out devils, but by Beelzebub the prince of the devils." How would Buckner answer the Pharisees? 3. Why don't evangelical Christians accept miracle stories recorded in ancient non-biblical works? Isn't it the case that evangelical Christians have decided a priori to accept biblical miracles and reject all others? Aren't the apologists' "objective standards" for accepting or rejecting extra-biblical miracles post hoc? I have no problem accepting miracle stories in non-biblical works. 1. Why is the authorship of most books of the Bible disputed? Why do many books of the Bible have no statement of authorship? Why are some books in the canon pseudepigraphical (lie about authorship)? The dispute lies in that people aren't applying the same standards to the Bible that they do to other ancient works. For example, see about the Gospels here. See here about pseudox. 2. Why did the early church not revere the scriptures as Christians do today, so that they added interpolations and made emendations? This is another vague question, but reverence does not necessaily mean no interpolations and emendations -- see here. I also argue that there is no interpolation or emendation that affects any Christian doctrine. 3. Why hasn't the Bible been transmitted to us in perfect condition if it is so important and if God had his supernatural hand in it? Why did both Israel and the church add interpolations, emend, and conflate the texts? Again, why should God cover for our mistakes? See here. Any why isn't the text good enough as it stands anyway? 1. Why is the Mosaic injunction against false prophets ignored in the canon? Deuteronomy 18:20-22 should disqualify Isaiah, Jeremiah, Ezekiel, Daniel, Jonah, Jesus, and Paul. There's another of those "hurled elephant" questions -- thus my answer: none of these guys have been disqualified. 2. Why is the canon disputed by the church? Is God content to let uninspired writings falsely be proclaimed as his Word? Furthermore, how do we know the canon is complete? My answer to this sort of idea: in addition to this, if Buckner thinks the canon is not complete, who are his candidates, and why should they be considered? As I noted, just throwing a book's name in the air and asking why it isn't in the canon isn't enough. 3. Why has no one been able to describe a consistent objective basis for establishing the canon? Why was the canon established by vote instead of on objective principles? Why was the canon not directly revealed by God? See item linked just above. 4. Why is so much of New Testament doctrine revealed through the use of occasional letters instead of in systematic books written, authorized, and canonized specifically to define Christian doctrine? Why didn't God deliver these himself, as he did the Law to Moses? Maybe this explains why the Old Testament Law has more clarity than the New Testament doctrines. Why did God leave the writing of systematic theologies to modern, uninspired writers, who cannot agree with one another? What exactly is the problem with revelation through letters? What does genre have to do with truth? What is missing that isn't found in the NT now? What are these disagreements? These are the questions that are begged in this query. 1. When Adam and Eve ate the forbidden fruit, why did God lie about what the outcome would be (Genesis 2:17),9 while the serpent told the truth (Genesis 3:5,22)? See "It says that Adam and Eve would 'surely die' if they ate of the tree, so why are they still alive???" 2. Why are women treated as chattel and inferior to men throughout the Bible? They aren't -- at least not by endorsement. See here. 3. Why is the Old Testament and most of the New Testament addressed only to free men, and not to women or slaves? Does God deal only with free males? 4. Why does the Bible condone slavery? 5. Why does Yahweh command genocide, including the killing of infants? Why does he command that all women who have "known a man" be slaughtered, but the soldiers are to keep the young virgins for their own use (Numbers 31:14-18)? Why does the Bible portray Yahweh as worse than Hitler (Deuteronomy 20:16-17)? Isn't it blasphemous to call the Bible "God's Word," when it libels him so? See Was God unjustly cruel to the Midianites? and here. 6. Why doesn't the Bible condemn polygamy? Is it not really a sin? In fact, the Bible seems to condone polygamy through examples of God blessing polygamists and by its explicit statements regarding David. None of these statements are given for consideration, but there is indeed a moral hierarchy here. Given that without polygamy, many of these women would have had no food or home of their own, it's actually rather a merciful action. 7. Why wasn't Lot condemned for giving his daughters to be abused by the men of Sodom (Genesis 19:8)? The Bible actually calls him righteous (2 Peter 2:7)! Does Buckner need an explicit condemnation to be sure something is wrong? As for 2 Peter, sure, Lot messed up in his time of weakness, and who doesn't: That doesn't make him any less righteous as a whole, especially in the context of Sodom. 8. How can Christians say that the First Amendment guarantee of freedom of religion is based on Judeo-Christian ethics when Deuteronomy 13:6-10 and 17:2-7 flatly contradict this? I know nothing about this argument -- who says it, and how? 9. How can being mauled by a bear possibly be a just punishment for name-calling (2 Kings 2:23-24)? Doesn't this contradict God's own edict of "an eye for an eye, and a tooth for a tooth?" See "Isn't that thing with the bears too excessive?" 10. Why is faith - believing something for which there is no evidence - a virtue? Who defines faith as "believing something for which there is no evidence"? "Faith" in the Bible means a persuasion or conviction -- the word was used as a legal term for forensic proof in the Greco-Roman world. 11. Why is rational skepticism a vice? If Christianity is true, won't the truth hold up under scrutiny? Shouldn't the church welcome and promote rational skepticism as a way of confirming and spreading the faith when people see that it fails to undermine Christianity? Why isn't skeptical literature studied and refuted in Sunday School classes? Who says it is a vice in and of itself? I have had teachers talk about and even bring in skeptical material, and I get to talk about it often. It would probably shock Buckner to hear that I was allowed to talk about Mithra from the pulpit. 1. Why do Moses, Ezra, Jesus, and Paul all disagree on marriage and divorce? Moses allowed divorce, Jesus disallowed it and also allowed it, Paul allowed it, and Ezra actually commanded it to appease God (Ezra 10). How is an honest Christian supposed to know what to do in this area? Studying context helps, for one. See Instone-Brewer's book Divorce and Remarriage in the Bible for one of the best studies to date. 2. Why does the New Testament teach by example that major decisions should be decided by lot (in Acts chapter 1 when Matthias is chosen)? It doesn't say anything here about all decisions, or major ones, and in this case was a matter of deciding between two equal and valid options. How is this any different from making a random pick when we cannot decide? Why is this a problem when all other relevant factors are equal? 3. Why doesn't the Bible provide unambiguous guidance for major divisive issues like abortion, divorce, war, church discipline, lending and borrowing money, etc.? Doesn't God want the church to be united? Doesn't God want individual Christians to know how they should live? General question, general answer: It provides unambiguous guidance, again, for anyone willing to do their homework and think matters through. It teaches no such thing; see Does Genesis teach a solid sky? 2. Why does the Bible teach that goats will have striped offspring if they see stripes when they drink at the watering trough, when this has been discredited by modern genetics? It doesn't "teach" that either; see here and here. 3. Why does the Bible record scientifically impossible events as factual? For example, the creation narrative, Noah's deluge, a solid dome over the sky, Earth supported by a foundation. Why has the evangelical church produced "Creation Science" explanations that are complete nonsense? Why is it that none of the more rational reconciliations of science and the Bible survives scrutiny? 4. How can it be that Psalm 16 and Romans 1 teach that the creation is a reliable means of knowing God ("natural theology"), but the scientific study of biological and geological origins contradicts the creation narrative in Genesis? Why does "natural theology" contradict "revealed theology" (the Bible)? Is the creation bearing false witness? Is the Bible bearing false witness? These are two issues beyond our scope, other than the links above, but I doubt if Buckner is doing any more than accepting uncritically what others tell him -- just as he used to accept the Bible. 1. Where is the justice in punishing us for Adam's sin? The Bible itself says that children will not be punished for the parents' sins (Deuteronomy 24:16). Furthermore, if God really created Adam not knowing either good or evil (Genesis 3:22), how could such a harsh and enduring punishment as death for Adam and all his descendants possibly be just? Our secular courts are more just than God when they show mercy on people who cannot distinguish between right and wrong, such as children and the mentally handicapped. And why isn't this doctrine of original sin found anywhere in the Bible except in Paul's writings? For Adam's sin see here. For Deut. 24:16 see here. 2. Where is the justice in punishing Jesus for our sins? If our courts of law were to accept the punishment of someone else in the place of the criminal, we would not say that justice has been done, but that injustice has been added to injustice. Would the church have me believe that two wrongs make a right? 3. How can sacrificing Jesus on behalf of the sinner atone for another's sin? This would be like killing my child to reconcile for the misbehavior of my neighbor's child. I have the capacity simply to forgive and forget without demanding compensation for small offenses. Why can't God do this? Does he simply want blood? 4. Why pray? If it changes God's mind then he is not sovereign. If it does not change God's mind then it is superfluous. It isn't meant to be done with reference to changing God's mind -- see here. 5. How can the doctrine of the Trinity possibly be true? Any attempt to make sense of it leads to contradictions. If it is so important, why isn't it clearly taught in the Bible? Why shouldn't an objective student of the doctrine conclude that it was created by the church to hide biblical inconsistencies about the nature of Christ behind a shroud of mystery? No mystery or inconsistency -- see here and here. 6. Why is God concerned about humans at all? We are less than a speck in the universe. Christianity has the hallmarks of being a religion made by humans for humans. Well, if Buckner wants a God who doesn't care, that's an interesting preference. It's enough to ask in reply: What does size have to do with anything? How would a religion made by God for humans look? 7. Why have all the rational arguments for the existence of God been successfully refuted? If God exists, is it unreasonable to suppose that there would be at least one irrefutable proof of his existence? I'm looking, but I don't see a full refutation here. This is not an argument or even a genuine question. 8. Why haven't the existing proofs of God's non-existence been refuted? Surely believers, who have the advantage of an indwelling Holy Spirit with an "infinite mind," cannot be stumped by "finite minds" of unbelievers working within the confining limitations of reason, can they? In line with the above vague generalization: They have been refuted. If Buckner thinks that kind of answer is good enough for us, it's good enough for him. 9. Why is it that some teachings are conveniently tautological (i.e., circular)? For example, you must pray the will of God in order for prayer to be answered; you must believe the Bible in order to understand the Bible; and the is the Word of God, therefore it is true. This is Buckner not knowing what prayer is for again -- see link above. As for the rest, I don't use them as arguments. 10. How exactly does "loving God and enjoying him forever" give meaning to life? Any satisfying secular activity can give meaning to life. Why does the Christian assume that a metaphysical meaning for life is necessary? Isn't it the Christian who imposes meaninglessness on this present life, declaring that meaning depends for its existence on the life to come? And if Christians did not believe they will live forever, would they continue to love and serve God? Isn't it really eternal life that the Christian loves, and not God? If purpose in this present life is really derived from loving and serving God, then what sense does it make for Christians to make meaning dependent upon a future life? Any satisfying secular activity? Like stamp collecting? All those stamps will rot, and so will you; if that's all you have, you may have meaning to last the moment, but Buckner is doing no more than trying to put a happy face on himself. Would I serve God without eternal life? Yes, I would. 11. Where is objective, verifiable evidence that a soul or spirit exists and survives the body after death? Why does the Old Testament deny such an idea until the later writings, which show the influence of Greek ideas? The idea of "progressive revelation" does not explain this. The OT does not deny such an idea, unless one grossly misinterprets Ecclesiastes as above. Buckner needs to explain what he means by "influence of Greek ideas" -- Greek terms were obviously used, since the Jews were taken over by the Greeks and had to deal with the language, but "ideas" is another matter. It needs proof, not mere assertion. 1. How could Adam and Eve ever have sinned if God had actually created them perfect, even if they did have free will? If God created them imperfect, how could a perfect omnipotent being create anything imperfect? 2. How can evil exist in the world if God is simultaneously good, omnipotent, and loving? Why is it that no theodicy stands up under rational scrutiny? General question, general answer: There are theodicies that stand under rational scrutiny. I'll refer the reader to the works of Alvin Plantinga, and here. 3. Why does the church say God did not create evil, when he himself claims that he did in Isaiah 45:7, Lamentations 3:38, and Amos 3:6? 4. Why does God expressly take credit for creating disabilities (Exodus 4:11)? If these are God's doing, then why does the evangelical church insist that disabilities are the result of the fall, or of Satan's work? 5. Why would a loving, omnipotent, benevolent god cause people to believe falsehoods so that he can condemn them (2 Thessalonians 2:11-12)? See If God hates lying, why does He use delusions? 6. Why is the Bible inconsistent on major theological issues such as the nature and existence of an afterlife, the efficacy of works of the Law with regard to salvation, and the distinction between soul and spirit? It isn't inconsistent at all, Buckner just hasn't done enough research. 7. Why does the evangelical church speak of absolute values when the Bible teaches situational ethics? Buckner does not see the difference between "situational ethics" and a "hierarchy of morals," which is actually what the Bible teaches. 8. Why is it not possible to formulate a systematic theology that agrees with the Bible in all points? 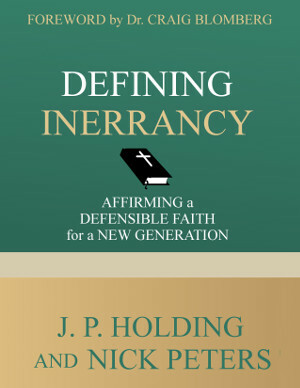 Roman Catholic theology introduces unbiblical and irrational ideas; Calvinistic reformed theology stumbles at the existence of evil; covenantal theology muddles the biblical distinctions between Israel and the church; dispensational theology is too hopelessly complex to be credible because every major inconsistency is explained away by spuriously introducing a new "dispensation;" and Arminianism destroys the sovereignty of God. Thousands of years of thought by hundreds of thousands of people, disposed of in just one long sentence? I wish I could dismiss my opposition that easily. Our take, here. 9. Why doesn't the Bible itself present its own "revealed" systematic theology. Doesn't God want us to have a consistent and complete framework of theology to support right decision making and teaching others? It does have a systematic theology, again, for anyone willing to be a disciple and learn. 1. Why does the church worship on Sunday, when the seventh day was established forever? There is no biblical support for Sunday worship; it is a tradition of the Catholic Church which Protestants accept. With apologies to my 7th Day Adventist friends, see here. 2. Why do many evangelical churches deny that baptism is essential for salvation, when the New Testament clearly teaches that it is? 3. Why do some churches object to wine since the Bible indicates that it is a gift from God (Psalm 104:14-15)? How can they continue to object even when they acknowledge that Jesus turned water into wine? Is this anything more than a holdover from prohibition? In fact, the Bible promotes drunkenness in Proverbs 31:6-7. 4. Why does the modern evangelical church embrace the extra-biblical doctrines of "having a personal relationship with Christ," having a "quiet time," "journaling," and the necessity of belonging to an "accountability group?" Doesn't the church understand its own religion? Why is it caught up in pop-religion? If these are not really doctrines of the church, then why is there social pressure to conform? I haven't felt any, and haven't seen any of this stuff. But I would point out that as human society changes, it seems fairly obvious that applications of eternal verities may have to change too. The OT law requiring railings around the roof now rules towards balconies and ledges. One may as well ask, "Why does the modern evangelical church embrace the extra-biblical teaching of railings on balconies?" One note though: Actually, accountability groups are not very far from providing what was natural for the early church as it was rooted in a collectivist, not an individualist, society. 5. Why does the church teach tithing for Christians, when it is only commanded of Old Testament Israel? Why didn't Paul teach tithing to the New Testament church when he had the opportunity to (2 Corinthians 9)? 6. Why do some churches ignore controversial teachings in the Bible, such as speaking in tongues, baptism for the dead, the requirement for women to wear head coverings and to remain silent, the identification of the "sons of God" in Genesis 6, the necessity of poverty in order to follow Jesus (Luke 14:33), etc.? Doesn't the Holy Spirit reveal the true meaning of these passages to believers? If so, why do sincere believers come to opposite conclusions on their own, and why aren't they able to come to agreement when they dialog with each other? Surely, Jesus is with them to guide them when two or three are gathered together in his name, isn't he, even if they misapprehended the Spirit's guidance when they were on their own? I don't know of any church that has ignored these things; again, it's more likely a matter of Buckner not checking up on the facts. For example, on baptism for the dead, see here. No, the Holy Spirit doesn't do our research for us -- that's never been promised, and the "two or three" passage gives no such promise or indication; see link above. 7. Why must Christians resort to divination (looking for "guidance," looking for "doors of circumstance to open or close," etc.) if the Holy Spirit dwells within them? What is the benefit of an indwelling Holy Spirit if it doesn't manifest itself in day-to-day living, and it has to be coaxed into revealing God's will in major decisions? I don't do this. Maybe that Buckner did shows why he has so many difficulties: He expected God to give him all the answers. 8. Why do Christians pray about whether to marry someone, when Paul says that if they want to get married they should just do it (1 Corinthians 7)? How does what Paul says amount to a "just do it"? This needs to be explained, not just claimed. 9. Why does the evangelical church rail against one-world government, since they say it is God's plan as revealed in Revelation? How can they justify speaking and acting against God's revealed plan? Since I don't hold that view of Revelation, this one doesn't apply to me. 1. Why is the evangelical church subject to the same social movements as the rest of society? If the church is headed by the living Christ, shouldn't the institution be a steady keel in a stormy sea? Why does Buckner think that having Christ as the head means people do not make foolish decisions? Conversion did not reduce us to automatons. 2. Why does the church trail rather than lead in social reforms? (For example: the rise of capitalism, rise of the scientific method and critical thinking, abolition of slavery, eradication of Nazism, women's suffrage, civil rights of African Americans after the abolition of slavery.) And why does the church dishonestly claim leadership in these reforms after the fact? This is another of those "complex issues in one sentence" questions. I happen to know, though, that believers were leaders in abolition and civil rights, even if the institutions were not. So can we be more specific? 3. Why are the church's day-to-day practices guided by cultural norms rather than by the perfect, absolute, unchangeable norms of God and the Bible? For example, why do churches separate children from their families and age-grade them like the schools, why does the church propagate self-help ideology when the message of the Bible is dependence upon God, why does the church accept and participate in competition where it has rejected it in the past, why has the service of women in the church been addressed only after secular culture has addressed women's issues, why does the style of music in the church and church architecture follow cultural patterns instead of defining cultural patterns? Yet again, Buckner lays all of these out as though they were proven and were actual problems, but I don't take it for granted. For example: What's unbiblical about age-grading and separation? Nothing. Why should the church have control over musical and architectural patterns, or take leadership in such areas? Why do we need to expend time and energy studying modern music patterns and then trying to make our music as different as possible? Isn't content more important than style anyway? Why is this even an issue? 4. Why doesn't the church understand Jesus's teachings? Why are most preachers afraid to preach straight through a gospel from beginning to end? Why do they skip over Jesus's "difficult" sayings and the enigmatic passages? I haven't seen this at all, not in my churches -- and I sure don't do it. 1. Why has the church done so little good and so much harm in 2000 years, while science has demonstrated remarkable progress in only 500 years? Why is the period when the church dominated western history universally referred to as the Dark Ages, while the period of breaking away from church dogma is called the Enlightenment? Since we've reduced history to a mere pinpoint, my response is only this: The church has done far more good in 2000 years than any other institution, including inspiring science; science has not given progress in and of itself, and in fact has given us harm as well, because it is not science that is what is at issue, it is what people do with it. The church did not "dominate western history" during the so-called Dark Ages (now less prejudicially called the Early Middle Ages), Black Plague and feudalism did; many Enlightenment advances were made by believers. 2. Why are the Crusades and the Inquisition and other church-sponsored atrocities politely ignored in many church education programs, leaving church members to learn of these in other venues, or, more likely, to remain ignorant of the heritage of the institution to which they belong and contribute. They aren't ignored in my church-education program. But then again, they were more like power trips than religious ones. See also my encyclopedia entries on those subjects; the alleged crimes of those events are vastly overblown. I have a question too: Why are Stalin's death camps and Mao's purges politely ignored by atheists? 3. Why does the church conceal and ignore and misrepresent legitimate criticisms and critics? If Christianity is undoubtedly true, why doesn't the church demonstrate it by refuting the whole body of skeptical literature in Sunday School classes? The church isn't trying to hide something is it? How can the church possibly maintain credibility when it is so blatantly partisan on the side of dogma, and obviously not dispassionately seeking truth wherever the evidence may lead. My questions in reply: What makes Buckner think his criticisms are legitimate? As we have shown, many are vastly minsinformed or offer little more than sound bites. I've refuted the whole body of skeptical literature in less than ten years and have not seen a new argument from their quarter in three years. The church isn't hiding anything -- there's just nothing worth seeing in skeptical literature. 4. Why do so many members of the church dismiss the veracity of unbelief without even giving it a fair hearing, especially in light of biblical condemnations of this behavior, such as "He who answers before listening - that is his folly and his shame," (Proverbs 18:13, NIV), and "The first to present his case seems right, till another comes forward and questions him," (Proverbs 18:17, NIV), for example. Well, I paid attention, and all Buckner did was put us on his "unworthy answers" list without a peep of response. For questions 1, 7, and 10, see link above in section on hermeneutics. 2. Why doesn't Jesus fit the real, clearly identifiable, messianic prophesies of the Old Testament? Why do the gospel writers ignore these prophecies? Why does the church condemn first century Jews for rejecting Jesus as the Messiah, when he clearly does not fulfill the Old Testament prophecies of Messiah? Why must we wait until Jesus' second coming to see the clearest prophecies fulfilled? This needs to be explained. Which ones does Jesus not fit? Maybe the sort of objections addressed here are in mind. There also aren't that many "second coming" prophecies and nearly all were fulfilled in the first century. The next few concern Jesus' genealogies; see here with some added hints on genealogies here and here. 8. Why does Jesus refer to the writings of Moses (Mark 12:26), when it is clear that Moses could not possibly have written the Pentateuch? Surely the son of God would know more about the Word of God than anyone else, wouldn't he? He did indeed, and Buckner can't just assume the JEDP theory and expect us to take it at face value. See here. 9. How can it be that Jesus contradicts the Old Testament (1 Samuel 21-22), saying that Abiathar gave David the showbread instead of Ahimelech, and saying that David had men with him, when he was actually alone (Mark 2:25-26)? Does the church expect me to rely upon the teachings of a "son of God" who is demonstrably mistaken about what God's Word says? No, the church expects you to be a disciple and a learner. See here and here. 11. Why would Jesus deliberately obscure the gospel by speaking in parables so that people would not understand, turn, and be forgiven (Mark 4:11-12)? Did he not come that all men might be saved? 12. Why was Jesus in the tomb for only two and a half days at the most, when he said he would be there three days and three nights (Matthew 12:40)? Surely the son of God would say precisely what he means, wouldn't he? This is actually an instance in which we need to understand Jewish idiom, which understood "a day and a night" to include even the smallest part of a day and night. A Jewish source from after the time of the New Testament puts it this way: "A day and a night are an Onah ['a portion of time'] and the portion of an Onah is as the whole of it" [J.Talmud, Shabbath 9.3 and b.Talmud, Pesahim 4a] Other examples of this kind of usage can be found throughout the Bible (Gen. 42:16, 1Kings 20:29, Esth. 4:16, Matt. 27:63). Jesus was in the tomb for only a small part of Friday and Sunday, but that counts according to Jewish idiom for the entire "day and night" for each of those days. As an aside, a strawman set up against this argues that because the reason for the discussion is a menstrual cycle, then this designation applies only for menstrual cycles. That is not the case. While the menstrual cycle was the "problem" causing the discussion, the resolution is completely independent of the problem and is not uniquely associated with it. day": In the Bible, the season of light (Gen. i. 5), lasting "from dawn [lit. "the rising of the morning"] to the coming forth of the stars" (Neh. iv. 15, 17). The term "day" is used also to denote a period of twenty-four hours (Ex. xxi. 21). In Jewish communal life part of a day is at times reckoned as one day; e.g., the day of the funeral, even when the latter takes place late in the afternoon, is counted as the first of the seven days of mourning; a short time in the morning of the seventh day is counted as the seventh day; circumcision takes place on the eighth day, even though of the first day only a few minutes remained after the birth of the child, these being counted as one day. Again, a man who hears of a vow made by his wife or his daughter, and desires to cancel the vow, must do so on the same day on which he hears of it, as otherwise the protest has no effect; even if the hearing takes place a little time before night, the annulment must be done within that little time. The day is reckoned from evening to evening-i.e., night and day-except in reference to sacrifices, where daytime and the night following constitute one day (Lev. vii. 15; see Calendar). "The day" denotes: (a) Day of the Lord; (b) the Day of Atonement; (c) the treatise of the Mishnah that contains the laws concerning the Day of Atonement (See Yoma and Sabbath).E. G. H.
I also found an answer I like just as much in Pinchas Lapide's The Resurrection of Jesus (91-2). He takes the reference to the "third day" as alluding to various passages in the OT where the after a "third day" something happens in the "history of salvation," (Gen. 22:4, 42:18; Ex. 19:16; Jonah 1:17; Esther 5:1; Hos. 6:2) and thus "has nothing to do with the date or counting of time but contains for ears which are educated biblically a clear reference to God's mercy and grace which is revealed after two days of afflication and death by way of redemption." In other words, it is a literary device, and thus must be read as one. 13. Why would Jesus prophesy that his kingdom would come in glory before some of those listening to him died, but the kingdom still has not come (Matthew 16:18, Matthew 10:23, Mark 9:1, Luke 21:31-32)? Surely the son of God could not have spoken a false prophecy, could he? And sure enough he didn't -- see here. 14. Why did Jesus say his followers must hate their families? Surely, when the son of God said "hate" he meant "hate," didn't he? Why would the son of God confuse us by using hyperbole? How could the examples of Luke 9:59-62, even if allegorical, be hyperbole anyway? Jesus clearly called a man to the irresponsible, disrespectful action of leaving his father, implying that he was not even to attend his funeral, and he called another to leave his family without even saying farewell or letting them know he was deserting them. See here. Confusion only results when one is not a serious disciple and learner. 15. Why was Jesus disrespectful of his mother? In John 2:4, Jesus uses the same words with his mother that demons use when they meet Jesus. Surely the son of God knew that Mary had the blessing of the Father, didn't he, not to mention that the son of God would never be rude? See here. That a demon used the same words is of no moment -- the words were common Jewish idiom and could be used in a variety of ways. 16. Why did Jesus lie to his brothers about going to Jerusalem (John 7:8-10)? Did God the Father send a lying spirit, as he did in 1 Kings? Like Father, like Son? See Did Jesus tell a lie? 17. Why did Jesus, by his own admission, break the Sabbath law (John 5:16-18)? This puts the lie to the Christian idea that the perfect Jesus fulfilled the whole Law, and therefore was a suitable unblemished sacrifice for our sins. See Did Jesus actually break the OT law? 18. Why did Jesus say the ruler's daughter was not dead? (Matthew 9:18-25; Luke 8:41-56) Either Jesus lied, or he performed no miracle, but the context clearly shows that it was understood to be a miracle. 1. If Christian theology and the church have a supernatural origin in an omnipotent God, then why has theology and the church evolved through naturalistic social processes over time? Too vague to warrant an answer. 2. Why does theology change from the beginning of the Bible to the end? Why are the later writings influenced by Greek thought (for example, immortality)? Why is there such a large theological gap between the Old and New Testaments? The changes are not explainable by the idea of "progressive revelation," or by any systematic theology. Again, too vague, so I too will be vague: There is no "change" and silences are not evidence of lack of information. Immortality is found in the OT, for example, at 2 Sam. 12:23, where David knows that he will see his son again. 3. Why was the doctrine of the Trinity unknown to the church until the fourth century? Why was the doctrine established by vote instead of by revelation? Why was the membership of the voting council loaded with Athanasians? Why was belief in this then-new doctrine made a condition for membership in the church? Why were Arians exiled and executed? The Trinity doctrine has roots in Judaism -- see links above. However the council was loaded, it was in the right. As for exiling and executing Arians, that may or may not have been extreme, but if they were causing souls to be eternally lost, what was their just punishment? 4. Why is Jesus so similar to the other suffering saviors of mythology? Why don't Christians believe any of the other virgin births and savior stories recorded in ancient literature? How is it that the ritual of Christian communion existed in the prior pagan ceremonies of eating the body and drinking the blood of their gods? How is it that the Christian ritual of baptism also existed in the prior pagan cults? Weren't the very defining doctrines of Christianity actually assimilated from the endemic pagan cults? Likewise, why are Easter, Christmas, the Lenten season, rogation days, and others, derived from pagan holidays. Didn't Christianity have any legitimate calendar of commemorations of its own? Put another way: "Have you stopped beating your wife?" See here -- every other "suffering savior" so far has been wrong -- no virgin births, no comparison to the Eucharist, and no useful parallels. As to pagan holidays: This has a germ of truth, but isn't it worth asking: If you want people not go to the sale at your competitors' store, doesn't it make sense to hold a better sale the same day and engage their attention? 5. How did liberal churches come to exist? If they are inclined to believe, why did they not continue to believe the "fundamentals?" Could it be because the fundamentals have insurmountable problems that discredit them? Liberal churches exist because people have their own agendas and prefer them to truth. If the fundamentals have problems, Buckner hasn't succeeded in showing it. 1. Why hasn't the church answered any of these questions in the 23 years I have been a part of it? 2. Why hasn't the church answered any of these questions in 2000 years? I can only conclude that it is because the church has no answers. I can only conclude that Buckner hasn't done his research, and that that is the real answer.